Amid encouragingly growing demand, India’s largest multinational flexible packaging materials and Solution Company Uflex Limited has been making strong efforts in expanding the availability of its unique Flexfresh™ Liner Bags in various geographies across the world. 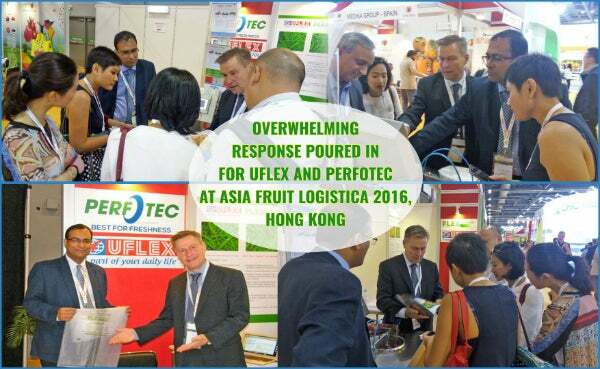 Having tasted enormous success in India, Europe, Africa and South America both Uflex and Perfotec decided to launch Flexfresh™ Liner Bags in Asia Fruit Logistica 2016 show that recently concluded at Asia World Expo, Hong Kong. Teams from Uflex and Perfotec showcased the Active Modified Atmospheric Packaging (MAP) technology to over 100 companies in the Asian Region explaining the open architecture technology for shelf-life extension. Speaking during the show, Bas Groeneweg, CEO Perfotec said: "I am honoured to present the Fast Respiration Meter to the Asian fresh produce industry for them to benefit from the shelf-life extension solution brought together by Perfotec and Uflex." It was interesting for customers to experience first-hand the technology live and some customers brought product together with them for testing, to select the right transmission bags which they carried back for testing and validation. Uflex Flexfresh™ vice-president N Siva Shankaran said: "Flexfresh™ is the only liner Bag in the world which is Biodegradable by composting giving total sustainable solution in the supply chain for fresh produce. With almost negligible weight loss and Touch Dry products, this shelf-life extension is the best possible amongst the options available to date." The show has generated enormous opportunities for both the companies and for the customers in their collective endeavour for reducing the wastage and weight loss in the supply chain of fresh produce. Several trials have been set up at New Zealand, Australia, China, Hong Kong, Malaysia and India for a wide variety of tropical produce. Expressing delight over the success of FlexFresh™ at Asia Fruit Logistica, Hong Kong, Uflex Limited chairman and managing director Mr Ashok Chaturvedi said in an official statement said: "This is indeed a path breaking packaging solution deploying Modified Atmospheric Packaging Technology that has seen the light of the day owing to collaborative efforts of Perfotec and Uflex. "I am happy by the overwhelming response Flexfresh™ has been getting from across the globe with more and more business queries fructifying by the days."